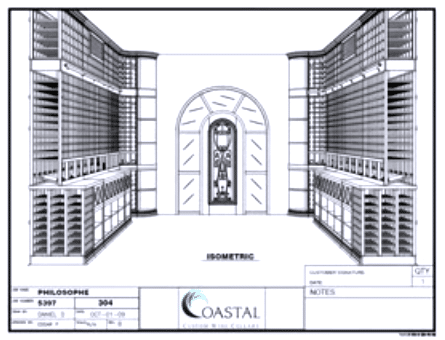 Stunning Wine Cellar Design by Coastal Custom Wine Cellars Philosophe . 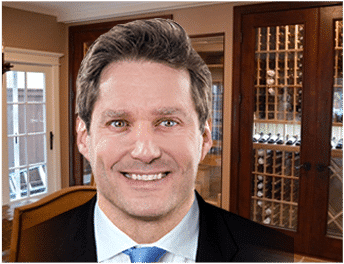 I’ll take you through the policies, procedures, and the timelines involved in creating a beautiful wine cellar by Coastal Custom Wine Cellars Los Angeles California. This job commenced in October 2009 and wrapped up and went to production in July 2010. This is a very large wine cellar with a capacity of nearly 4,000 bottles ultimately. 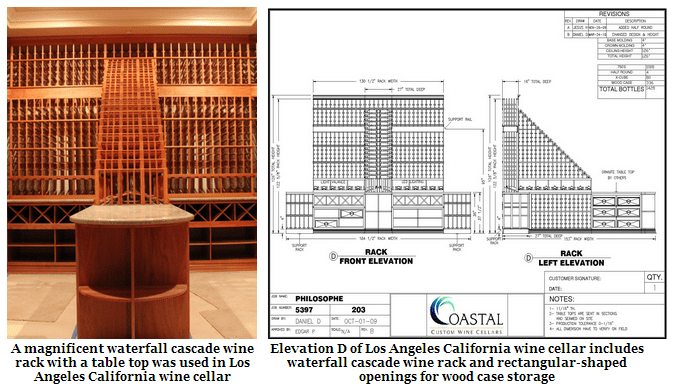 After the gentleman contacted Coastal Custom Wine Cellars Los Angeles California, there were some initial discussions and he shared some basic information with me. He simply drew the shape of the wine room on a piece of paper, as you can see, showing me the placement of the door down here, the left side dimensions, and the back wall dimensions of 182 inches. He wanted to maximize the storage in this wine room with 10 ft. ceiling height. Therefore he needed a rolling ladder or some sort of ladder. We ultimately included a rolling library-styled ladder. He wanted to maximize the storage, cool the room to 55 – 60 degrees, and include a beautiful wine cellar entry door, which we also provided. We had long discussions of his wine collection and how they broke down in different sizes of bottles, how he wanted to manage, display, and store them as well. What we did is we took this basic wine cellar design to my architects or CAD team at the factory and a few days later we were given the opportunity to look at a three dimensional design package. Now this is not the first one. This wine cellar design Philosophe actually went through four changes, subtle changes over a period of time and this is the final product. This is an overhead view of the room. All verified dimensions are posted, along with the elevations of each wall. This gentleman had a total, as I’ve said, of nearly 4,000 bottles – 3,816 to be specific. It broke down to a combination of split bottles at 156; Champagne or over-sized bottles at 92; 816 bottles stored in wood cases; and some magnums at 160, openings for magnums are 1.5 liters. It’s a very large collection in this Southern California home. Let’s look at a few of the elevations. These are true radius curved corners. There’s no segmented or angled effect. All the racks are resting on a 4” base or toe-kick, which keeps the racks up off the floor. This is a support rail here that you’ll see on some of the other drawings to accommodate the track for the rolling ladder and the brackets. This rectangular shaped area right here is where the fan coils are housed and we clad them in a wooden grill cover and a louvered grill cover as well, so that the mechanical aspects are concealed. I’ll show you some photographs here shortly. These rectangular shaped openings with these icons here are representative of wood case openings and storage. We created coming down the center of the room off the back wall towards the entry a beautiful, magnificent waterfall cascade effect that ends into a granite tabletop, which was supplied by the customer. There is a lot of countertop space in this wine room because, as you’ll see here in just a moment, the bottom area up to countertop height, as you can see in this 3D drawing, is actually 27” deep or double depth storage above it single deep storage. You can see how the cascading waterfall effect creates a beautiful presentation or statement to the wine room. This is the look head on. Of course, we created a beautiful entry door for custom wine cellars. This is all glass. The transom and sidelights are all true radius. We supplied the door with a wrought iron grill and a dual paned glass. We’ll certainly have some beautiful pictures to share with you. Right now we have some job site pictures that were shared with us. This is one view. As you can see up here on the top, this is the fan coil with the grill cover that I mentioned, and here is a front view of the magnificent waterfall coming down. We’ll post new pictures shortly after it is fully installed and stocked with the rolling ladder. Click here to view another custom wine cellars Los Angeles project.